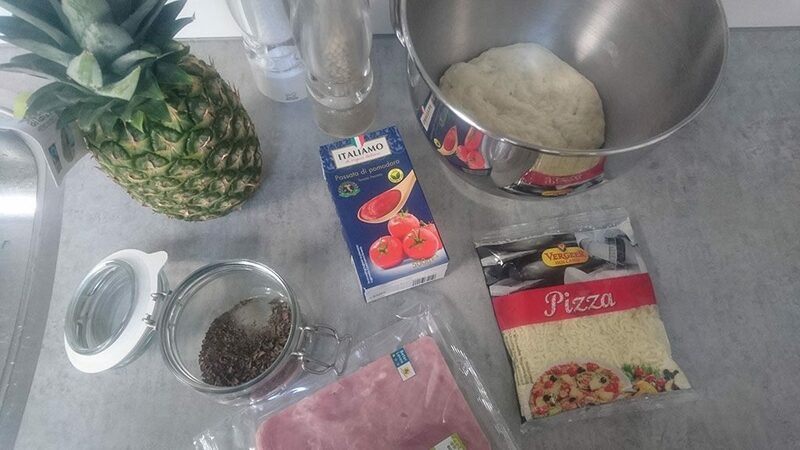 Easy recipe for a delicious Hawaiian pizza, created with home-made pizza dough and sweet pineapple. Recipe for 2, ready in 25 minutes. START by making one recipe for pizza dough, click here for the recipe. 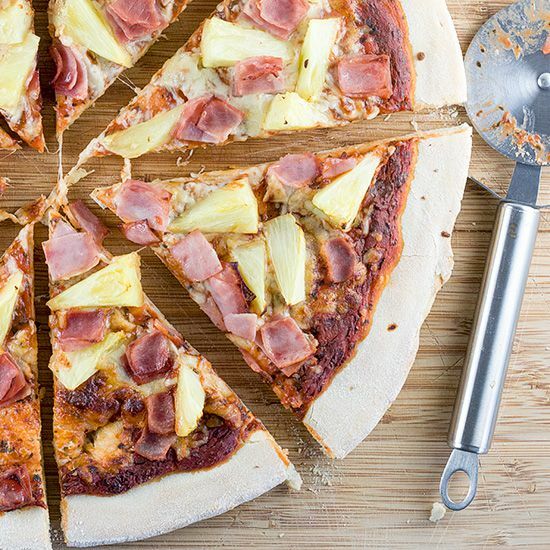 You can skip this step when using a – pizza crust. SLICE both ends off the pineapple, then place it straight up onto the cutting board. TRIM the edges using a chefs knife. SLICE the pineapple lengthwise into 4 equal parts, then slice off the hard inner part. SLICE into triangles, cubes or slices. STORE the remaining 1/2 pineapple in the refrigerator for use in another recipe. STACK 3 slices of ham on each other, then slice into squares. ADD passata into the bowl, mix together with a small handful dried oregano. SEASON using pepper and salt. PRE-HEAT the oven to a temperature of 220 degrees Celsius or 430 degrees Fahrenheit. DUST the kitchen counter with some flour and roll out the pizza dough into a round shape. PLACE the pizza crust onto the baking tray with greaseproof paper. USE a tablespoon to divide the pizza sauce, leave the edges free of sauce. 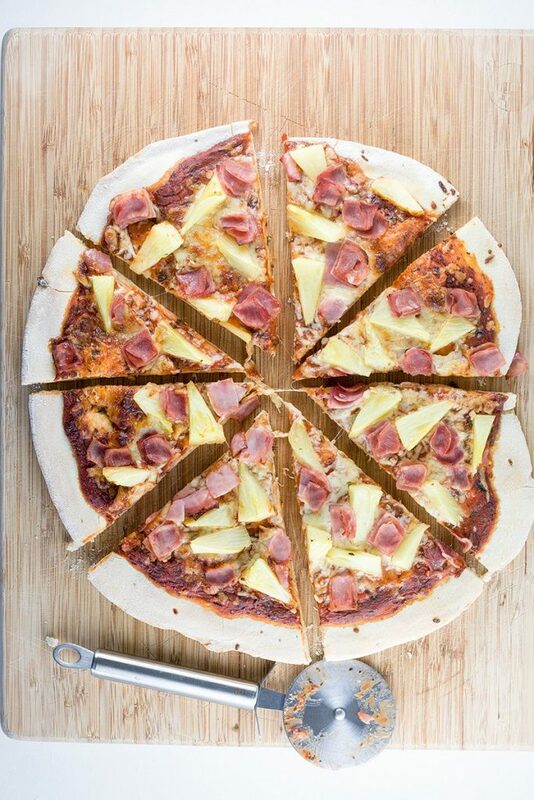 DIVIDE cheese, ham and pineapple over the pizza crust. BAKE the pizza in 10+ minutes in the pre-heated oven, depending on how powerful the oven is. 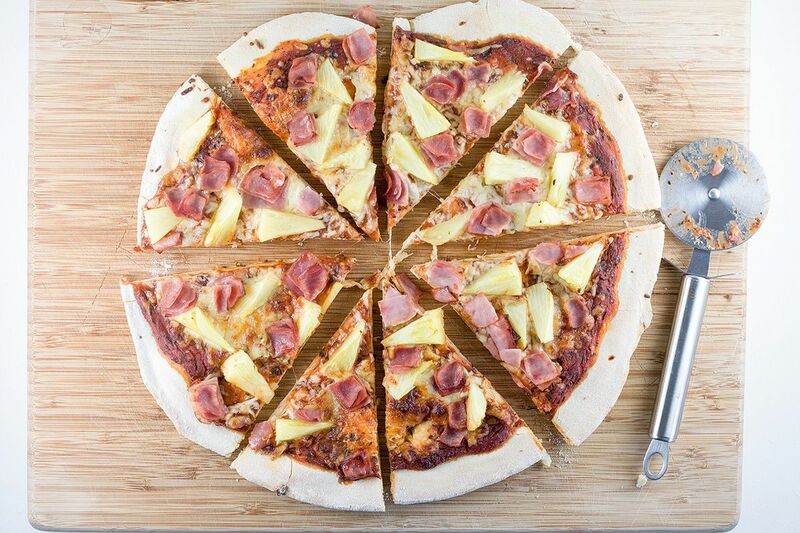 CHECK after 10 minutes, then remove the pizza from the oven and equally slice using the pizza cutter. Enjoy your meal!